The price for two Aegis Ashore batteries could exceed $5.4 billion — over twice the amount initially cited by the Japanese government. Japan’s two Aegis Ashore batteries, the land-based variant of the Aegis combat system for defense against ballistic and cruise missiles, will likely cost around 400 billion yen ($3.6 billion), double the initial number quoted by the Japanese Ministry of Defense (MoD), according to a Japanese government source. In December 2017, the Japanese MoD still spoke of acquisition costs of a around $2 billion. Not much is publicly known about the LRDR. According to the Lockheed Martin website: “LRDR is a long range radar that will provide precision metric data to improve ballistic defense discrimination and replace existing sensors in the Ballistic Missile Defense System (BMDS).” The radar uses proven solid-state radar technologies with proven ballistic missile defense algorithms for target selection. The LRDR will reportedly enable interception of incoming ballistic missiles at midcourse. The LDR is a “midcourse sensor that will provide persistent long-range midcourse discrimination, precision tracking, and hit assessment and improve BMDS target discrimination capability while supporting a more efficient utilization of the GMD interceptor inventory,” Lieutenant General Samuel A. Greaves, the director of the U.S. Missile Defense Agency, testified earlier this year. However, the LRDR has been designed for the U.S. Ground-Based Midcourse Defense (GMD) system, to defend the U.S. homeland from long-range ballistic missile attacks, whereas Aegis Ashore batteries have been primarily designed for intercepting short to intermediate-range ballistic missiles, although Aegis Ballistic Missile Defense (BMD) batteries reportedly have the capabilities to intercept intercontinental ballistic missiles (ICBMs) during their post-boost phase and prior to reentry. 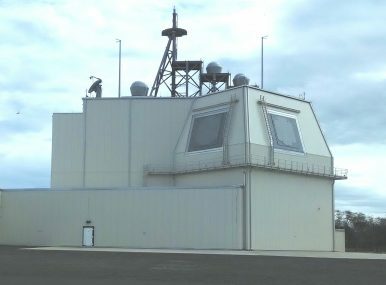 The Japanese MoD plans to deploy the two Aegis Ashore batteries by 2023 to supplement Patriot batteries capable of engaging short- and medium-range ballistic missiles in their terminal phase and Aegis-equipped guided-missile destroyers, four of which are currently operationally deployed by the Japan Maritime Self-Defense Force (JMSDF). While the two batteries are expected to be stationed in Japan’s Akita and Yamaguchi prefectures, the MoD recently announced that a geological survey inspecting the respective deployment sites has to be postponed. The deployment of the LRDR-based new radar system alongside the Aegis Ashore batteries would means that the missiles could be fired at an extended range, although the Japanese variant of the radar will likely boast a reduced range. The batteries will be capable of firing the SM-3 Block IIA interceptors with an estimated maximum operational range of 2,500 km (1,350 miles), as well as the supersonic SM-6 missile interceptor with an approximate range of over 180 miles (290 kilometers).